The first wallpaper i've made that i dare call a wallie. when i asked my brother what he thought of it, he said "ehn." i hope it's not as "ehn" as it he thinks it is XD Kanon is one of my favorite series, and Mai's my favorite character! she's so calm and composed and cool all the time, and i wanted to make a wallpaper about her. so here it is! 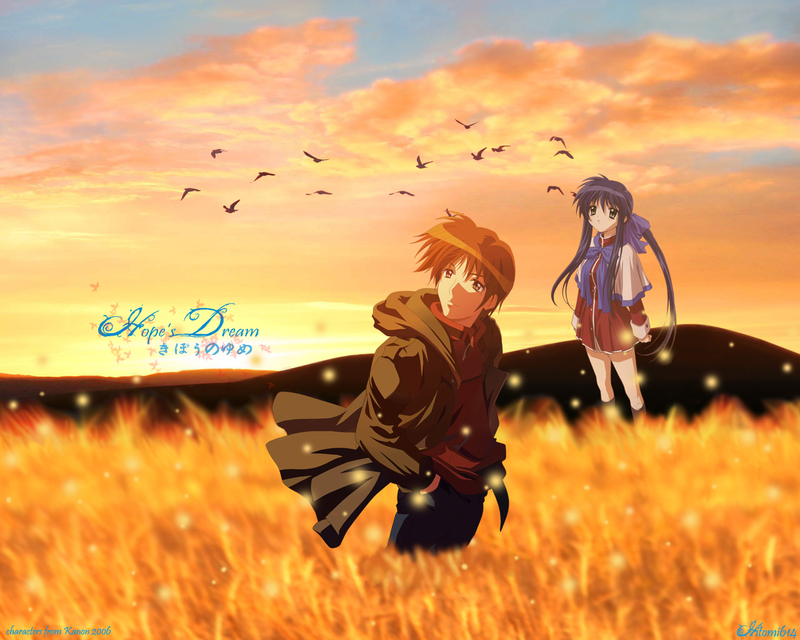 the episode with Hope (ep 15 of Kanon 2006) inspired this. the golden field is from back when Mai and Yuuichi were kids, before the school was built over it. the sunset...well, the scene with Hope had a sunset-ish feeling, so i just put that in. in truth, the birds were originally there just to fill up the empty space, but then i thought that signified friendship, so that was nice. i thought the whole thing still looked a bit empty by the time i had finished all that, so i threw in some white floaty things cause there were so many of those in ep 15, and they're pretty! i hope i've done them well. i titled it "Hope's Dream" because i thought it was Hope's dream that Yuuichi would come back and play with Mai again. and also "dream" cause Mai wasnt awake in the scene where Yuuichi talks w/ Hope. note: they are NOT looking at the birds! the perspective would be way off if they were. this wallpaper is for my friend Ed, the coolest otaku i'll ever know. Wow scenery is great! Love it so much! The background looks good and all details are really well done! Yichi and Mai are back to their childhood memories... where they used to play hide s seek... :) And "Hope" is the power within Mai that she finally accepted..
i need to get back to watching kanon. I love the background in this.